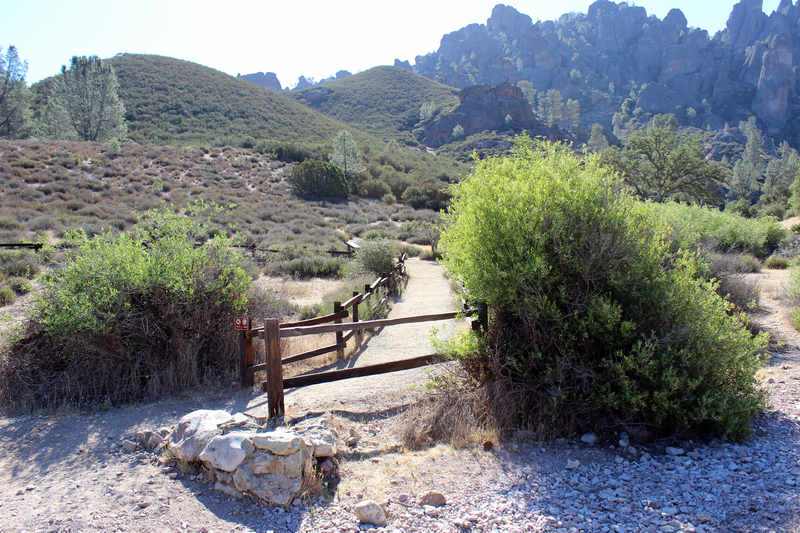 Balconies Trail, a 2.4-mile loop with an elevation gain of 200 feet, is a perfect introduction to Pinnacles National Park. 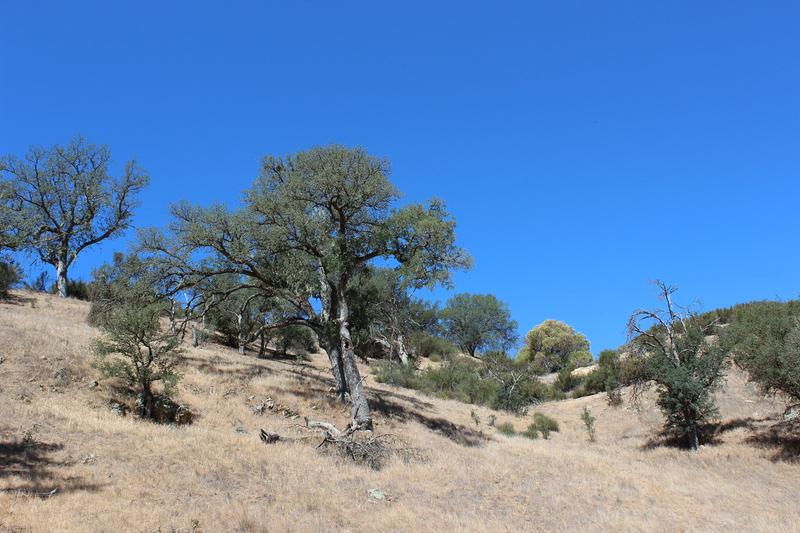 From the oak savanna near the parking lot, it winds through chaparral areas before entering a canyon carved by the West Fork Chalone Creek. 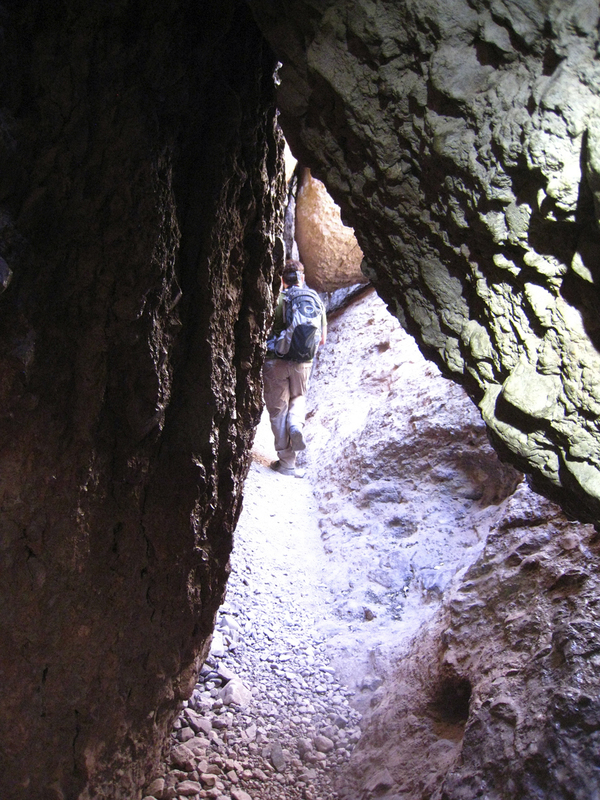 The trail climbs in a series of switchbacks up the lower part of the Balconies cliffs before looping around and passing through Balconies Cave. 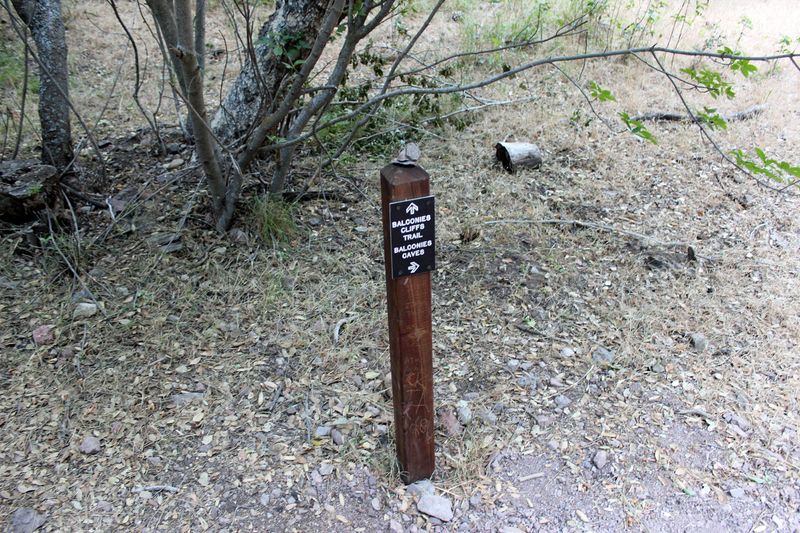 The relatively short trail passes through three (arguably four) of the five habitats in the park. 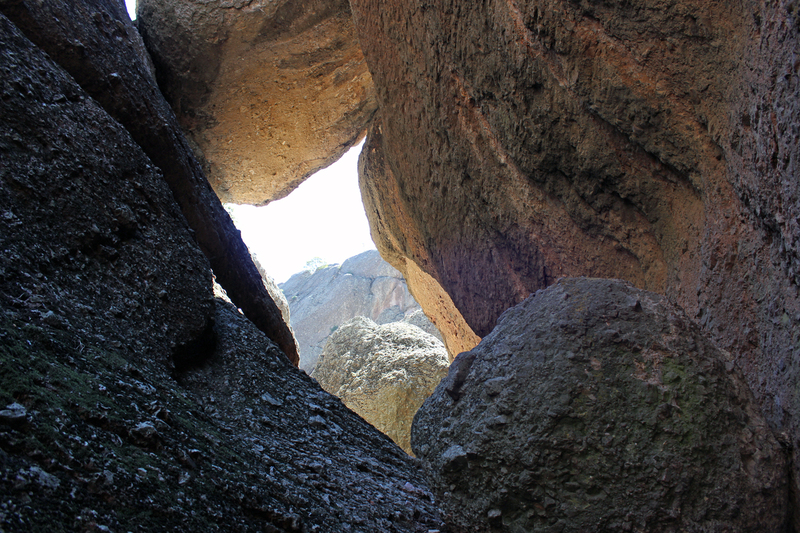 It offers sweeping vistas, great bird watching, and a scramble through a talus cave. 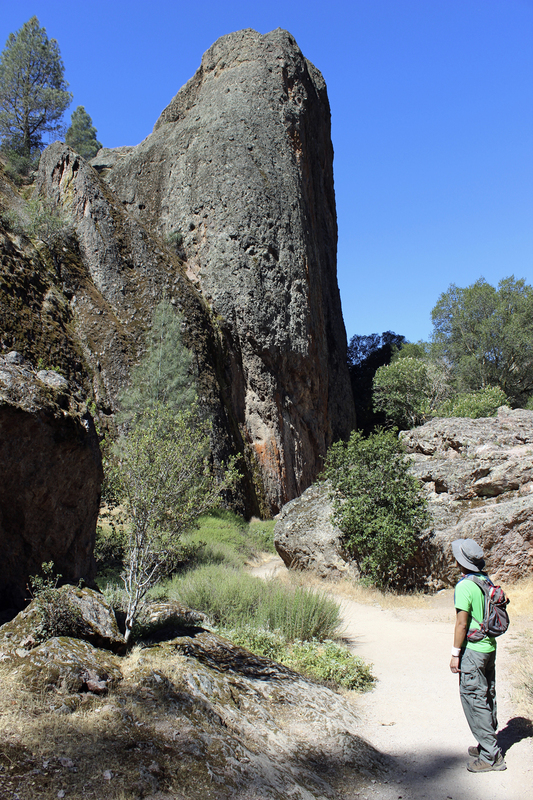 We always intended our visit to Balconies Cave to be the first item on our to-do list at Pinnacles, preferably as early as possible on Friday so that there would be relatively few other visitors. 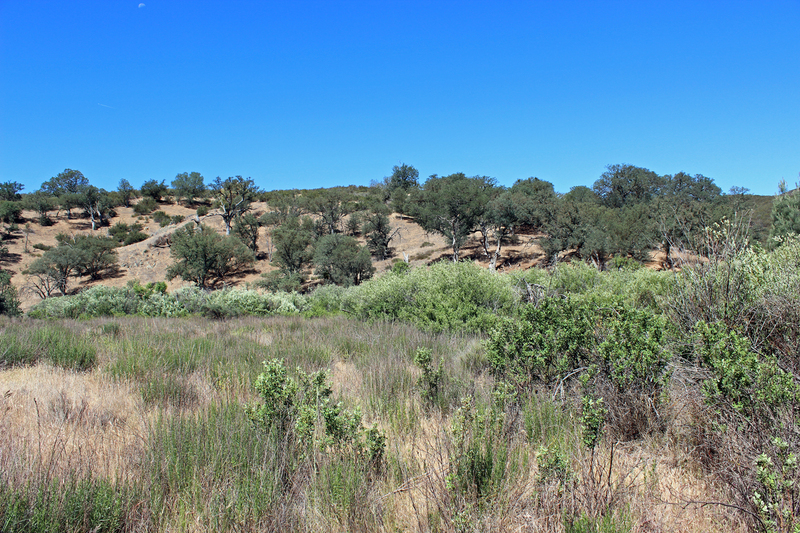 The first part of the trail passed through rolling oak savanna. 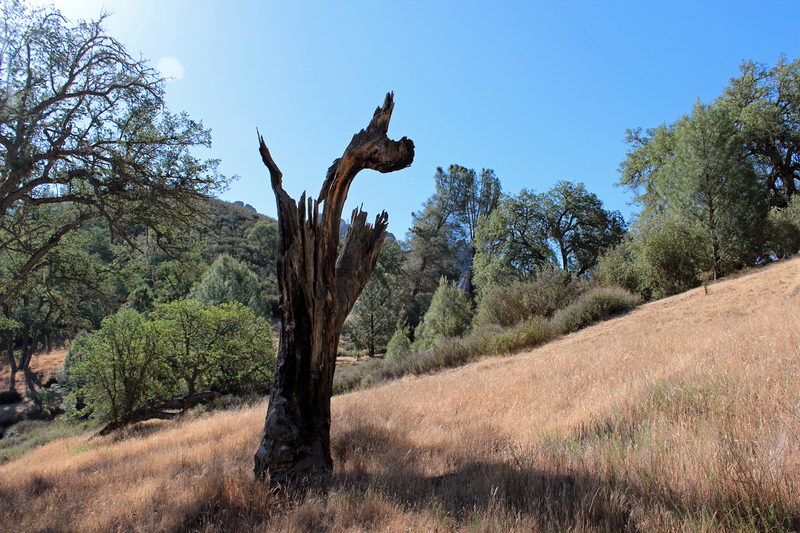 The park was under a no-fires alert because it had been so dry. 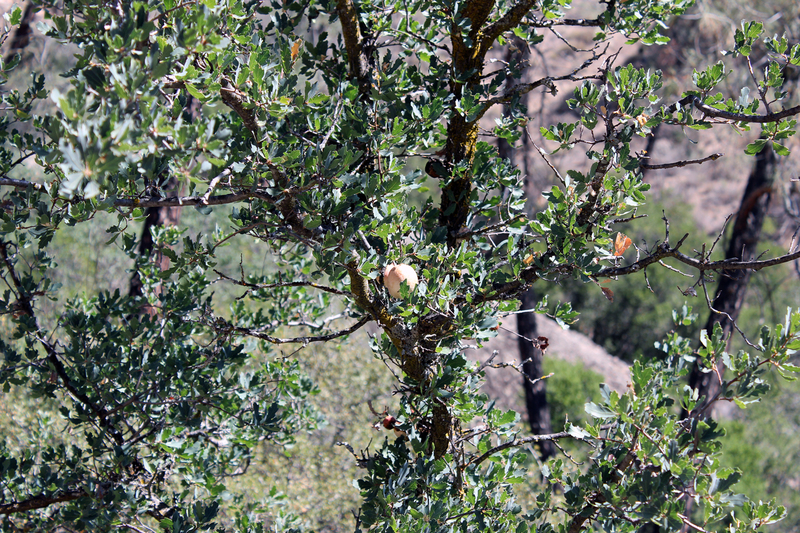 At the time of our visit at the end of May, there hadn’t been rain for six weeks. 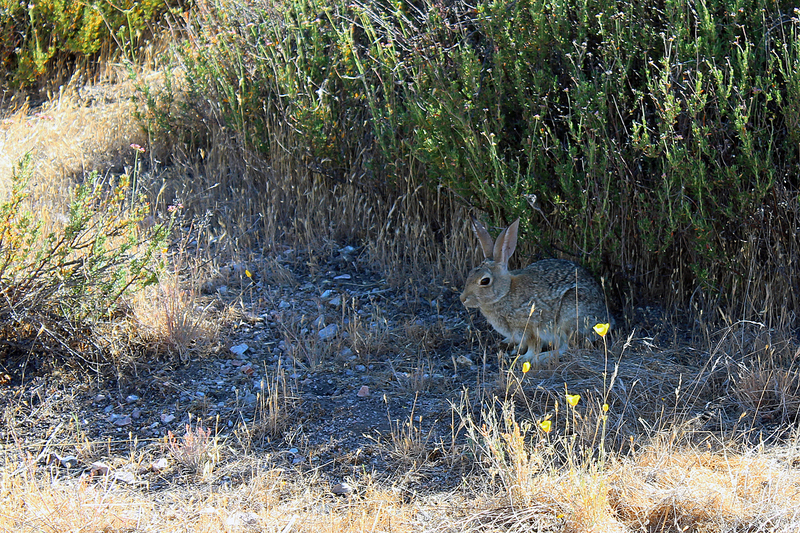 Regardless, and even though the grasslands were brown, they still felt alive. 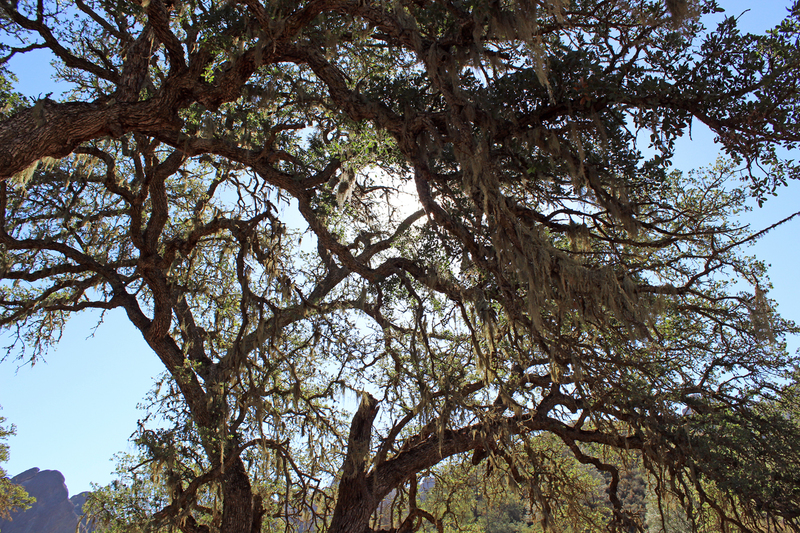 We were surprised by the amount of Spanish moss hanging from the branches. 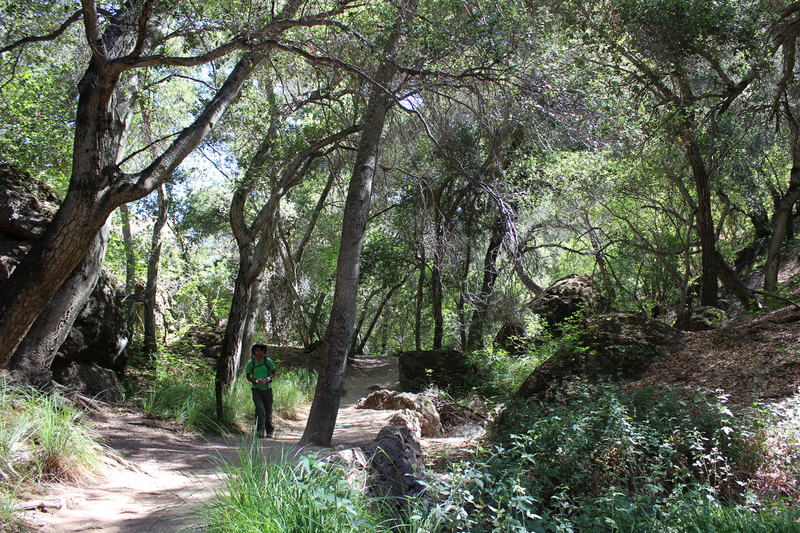 Throughout our visit we would encounter breathtaking pockets of greenery. 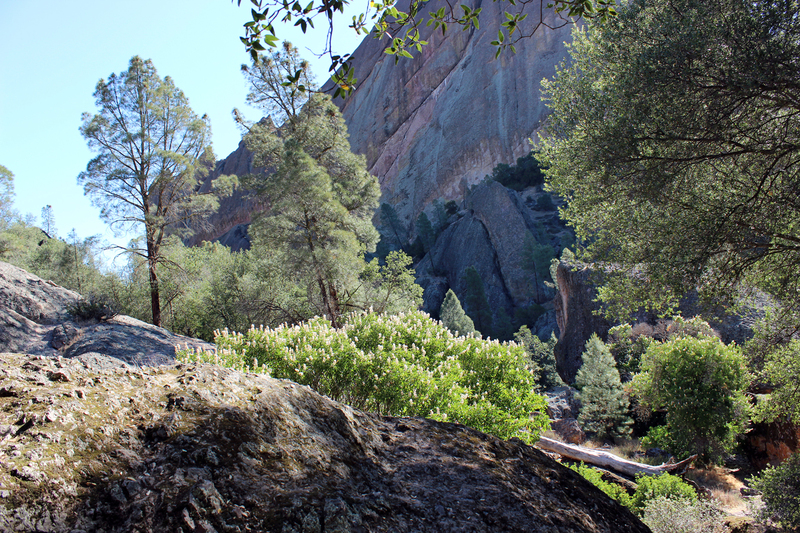 The Balconies cliffs are at the center of the image. 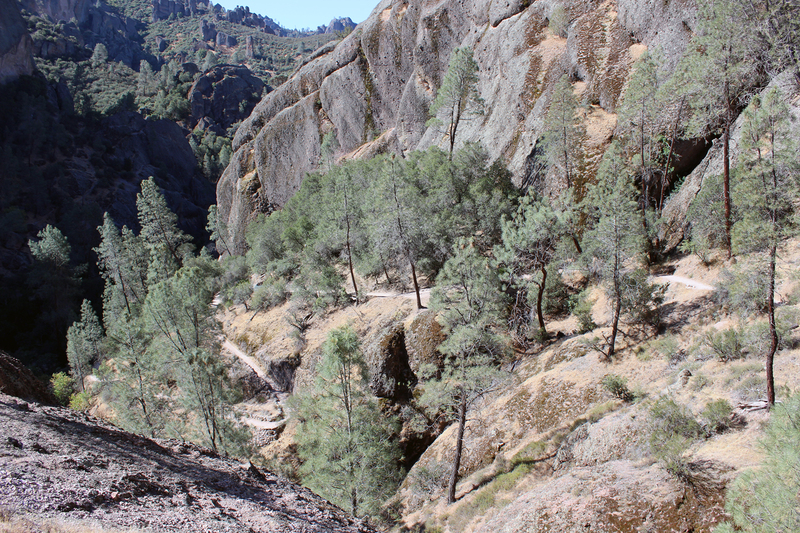 The trail leads into the canyon separating the cliffs from Machete Ridge to the right. 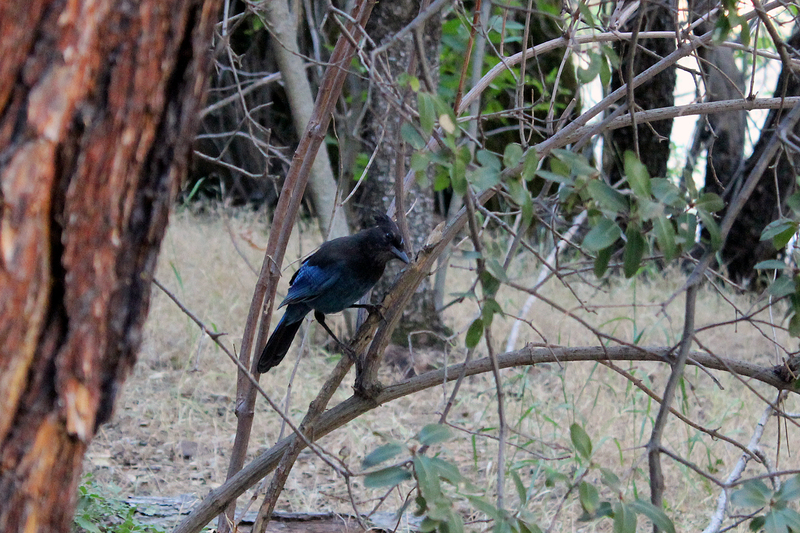 It was about 9:20am. 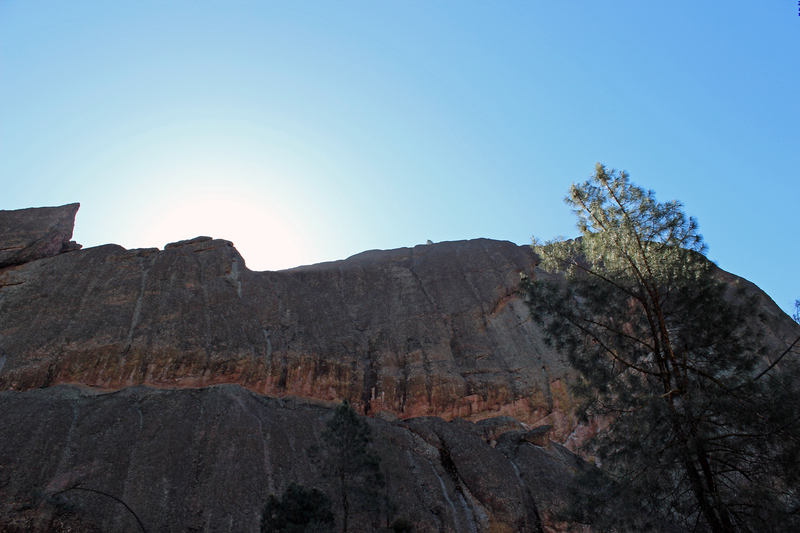 As we hiked north into the canyon, the sun was stil hidden by the mass of the High Peaks and Machete Ridge to the east. 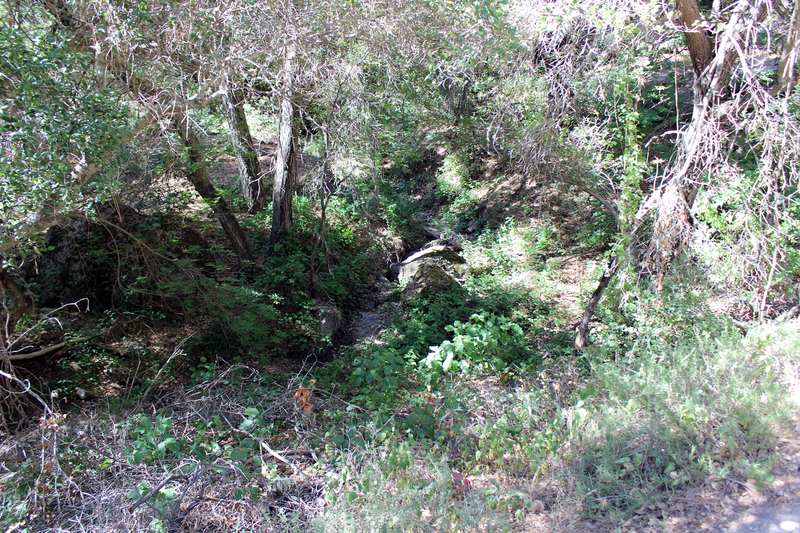 Immediately the vegetation grew more lush as we entered the riparian zone along West Fork Chalone Creek. 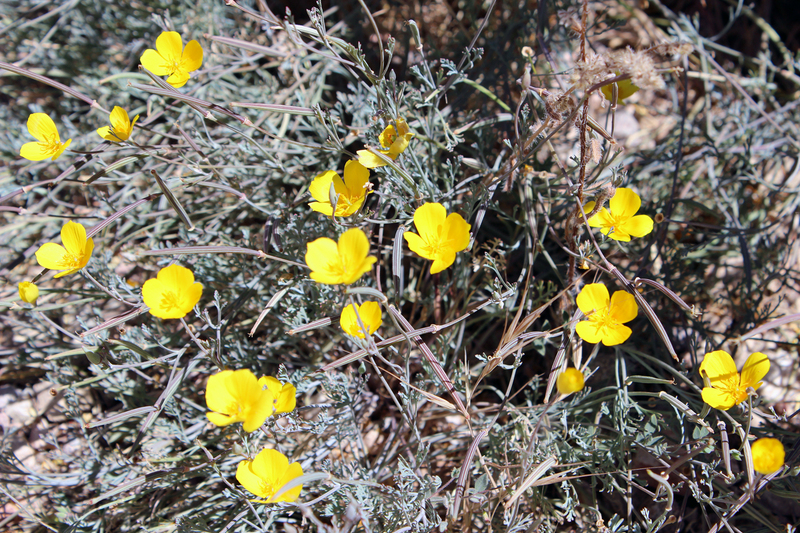 A cool breeze, fragrant with the scent of wildflowers, blew toward us from the canyon. 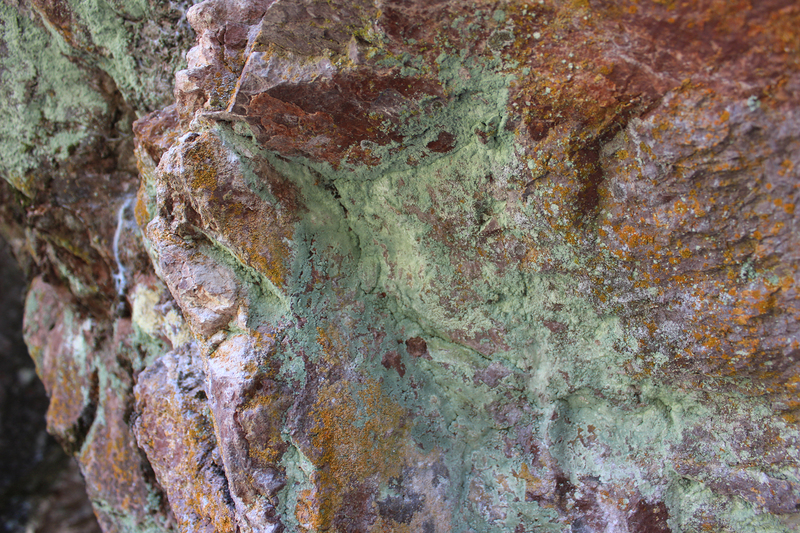 Lichens in an array of hues are found throughout the park, aiding erosion. 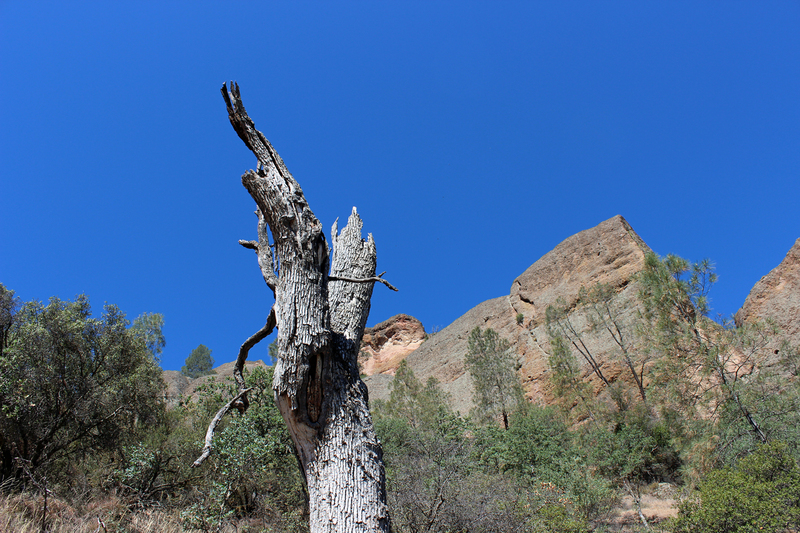 Machete Ridge looms to the right above the canyon. 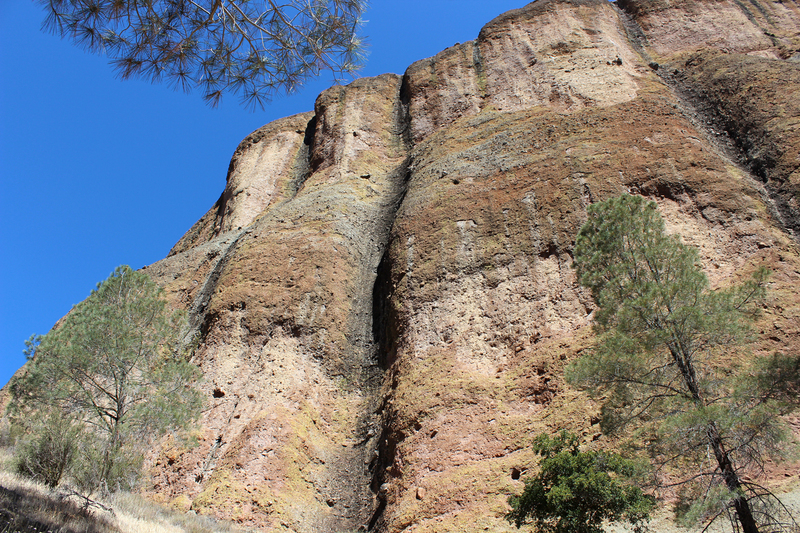 The ridge and the Balconies cliffs were one massive formation before the creek cut a canyon separating them. 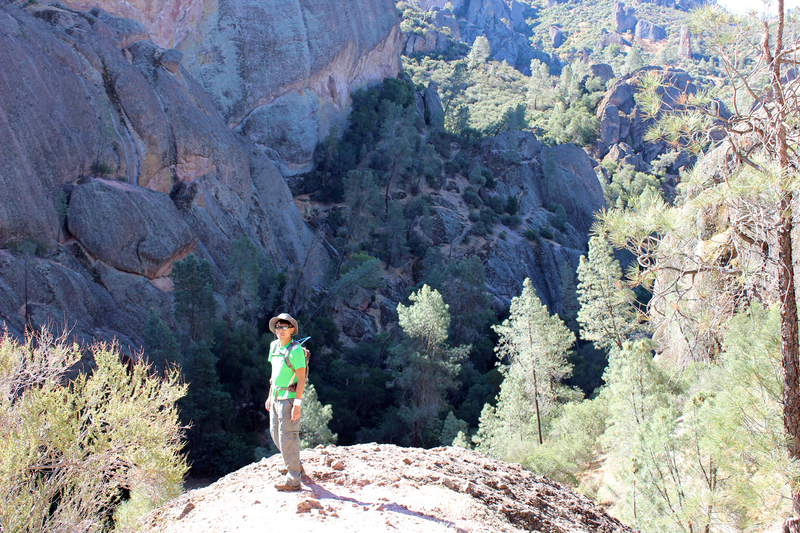 At the trail’s fork, we decided to hike up toward the Balconies cliffs first and then return via the cave. 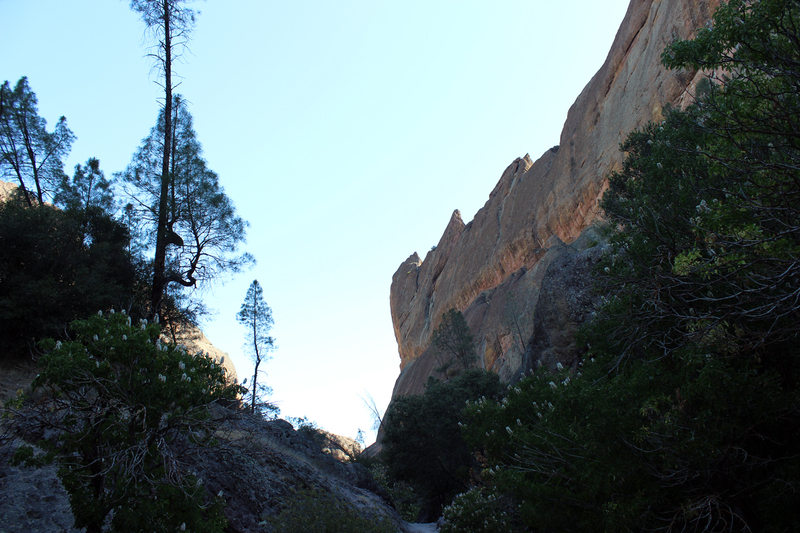 Looking back at the switchbacks of the trail from just below the Balconies cliff face. 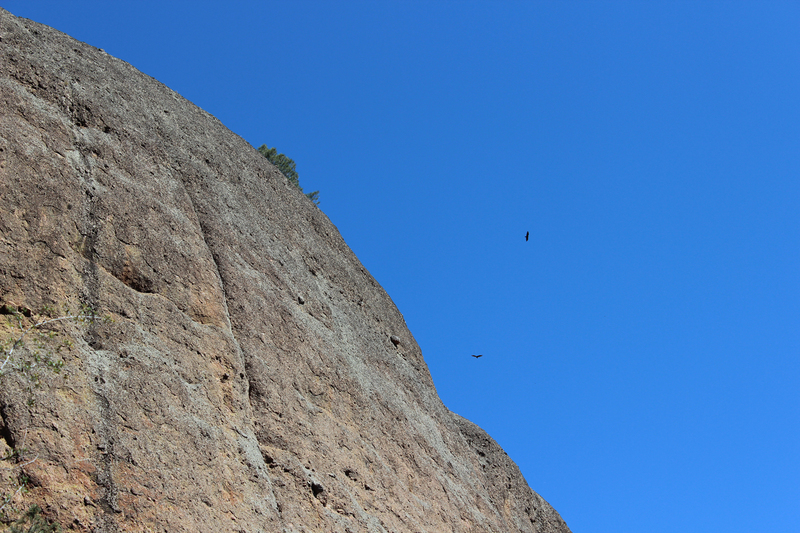 Looking up, we spotted what we thought might be California Condors. 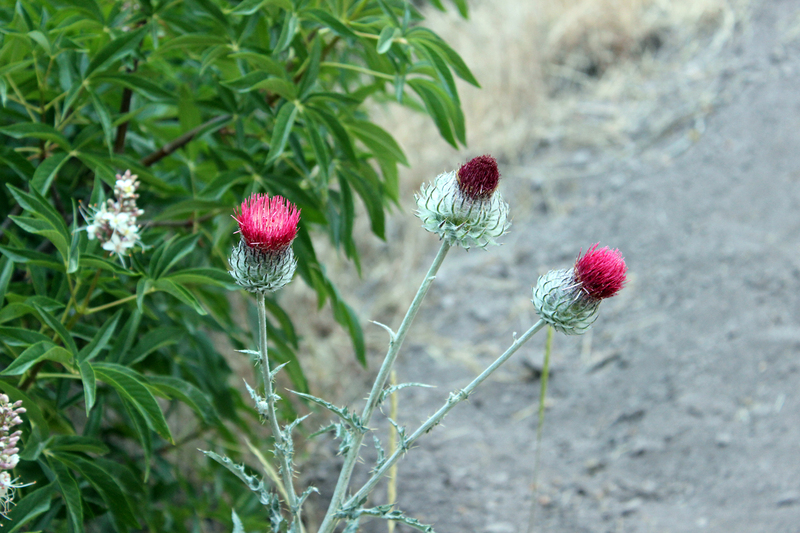 We’d learn later that they were not. 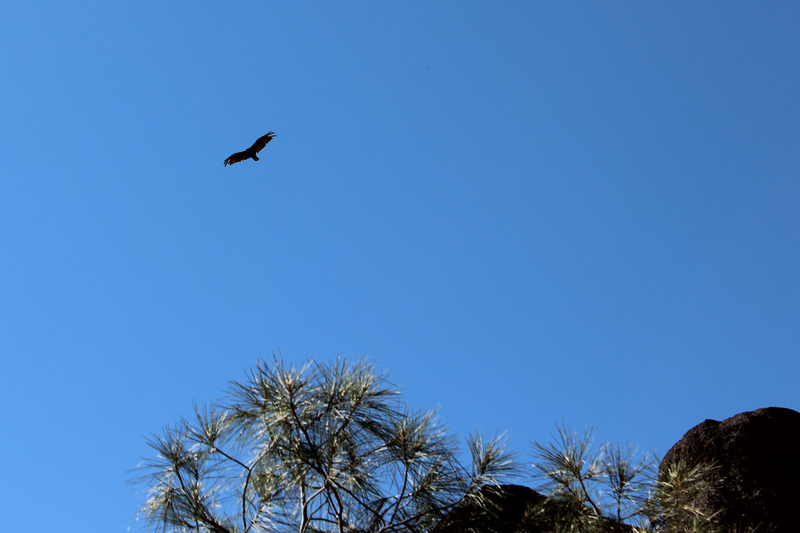 They were much more common Turkey Vultures. 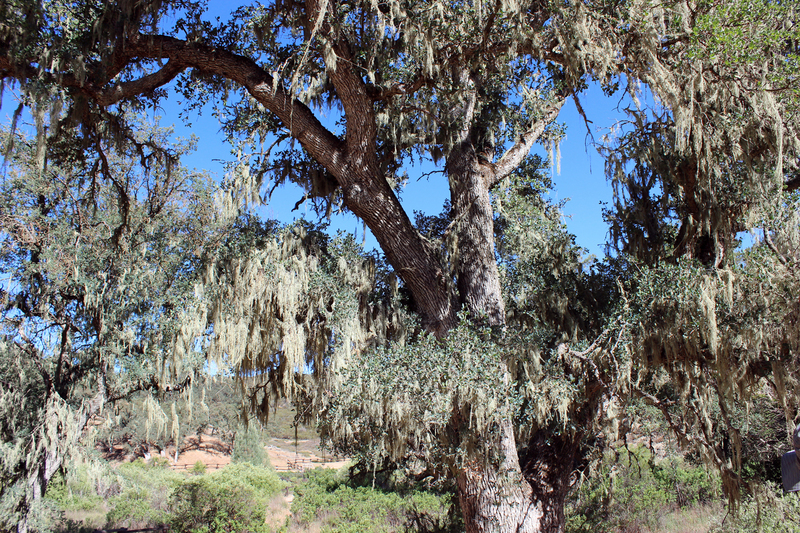 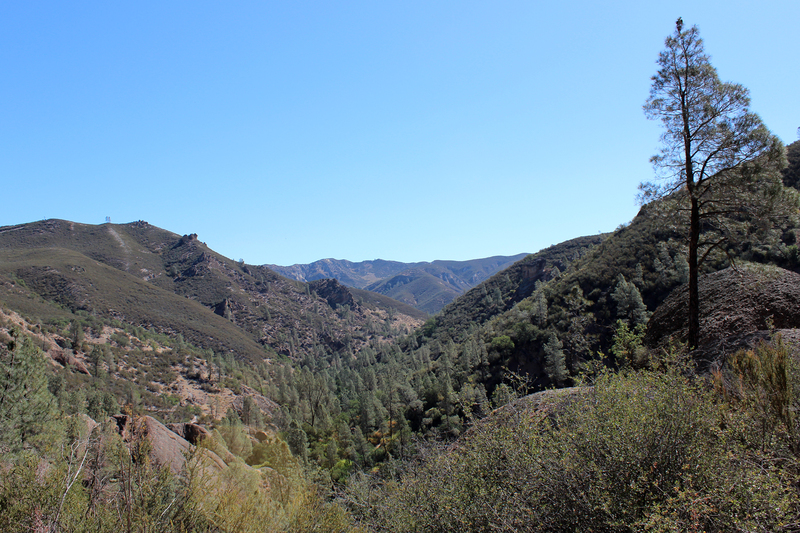 Before the trail descended back into the canyon, it offered a view northeast into the park, with Gray Pines in the valleys and chaparral on the hillsides and ridges. 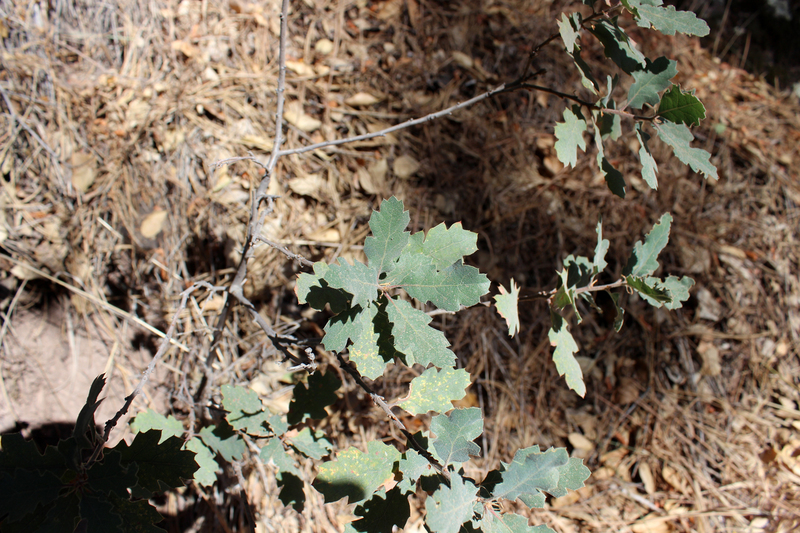 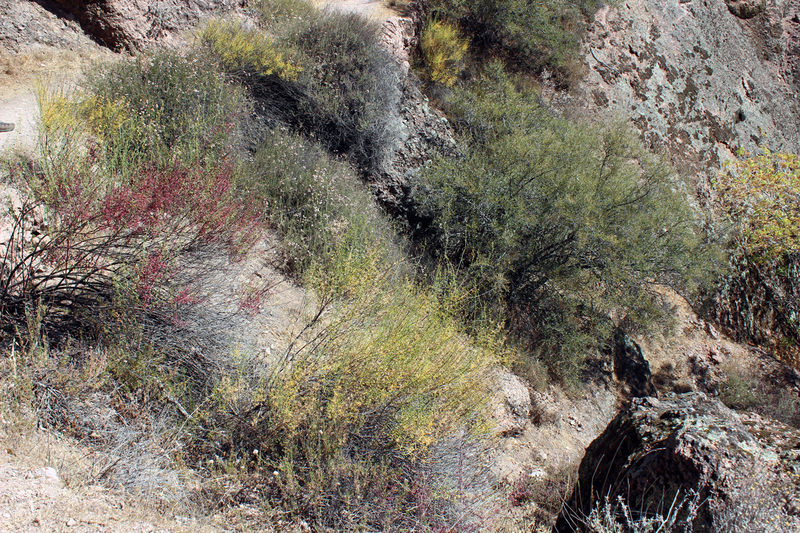 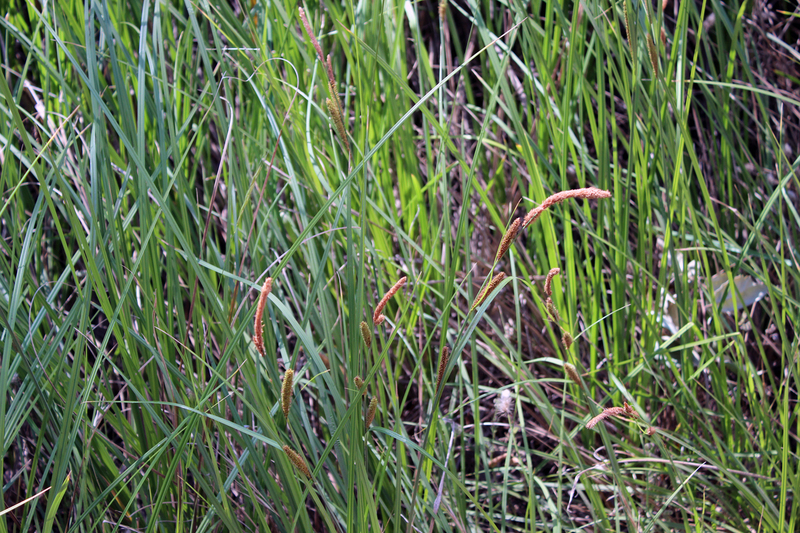 Even the scrubby chaparral plants boast a surprising range of colors and textures. 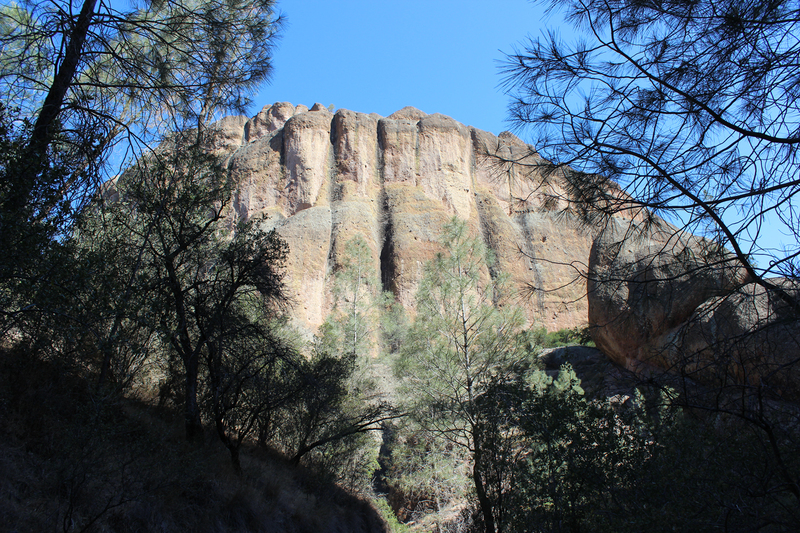 Machete Ridge, seen from the angle that gives it its name, looms above the canyon. 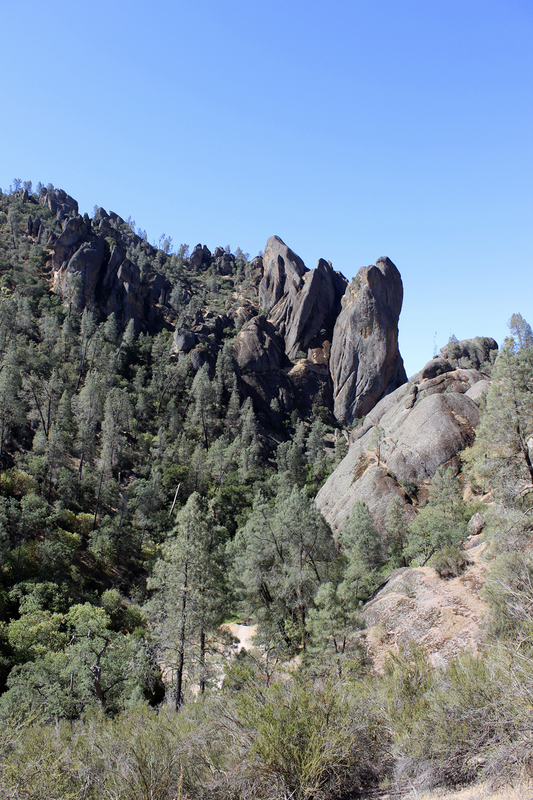 The trail looped around and returned to the valley floor, where we headed southwest toward Balconies Cave. 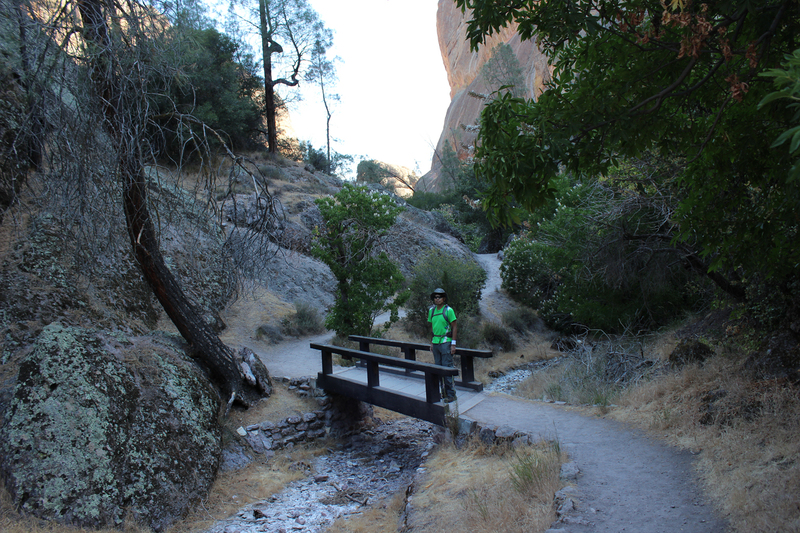 The canyon floor along West Fork Chalone Creek was lush with vegetation. 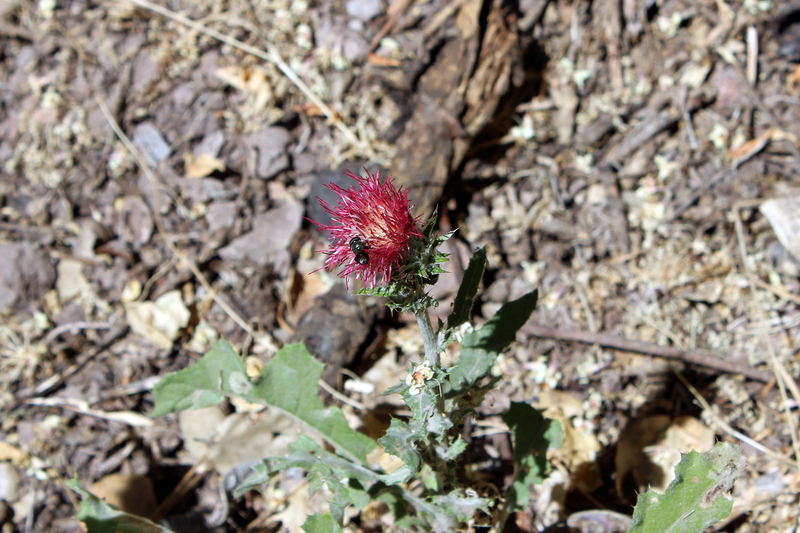 Green Sweat Bee on Venus Thistle. 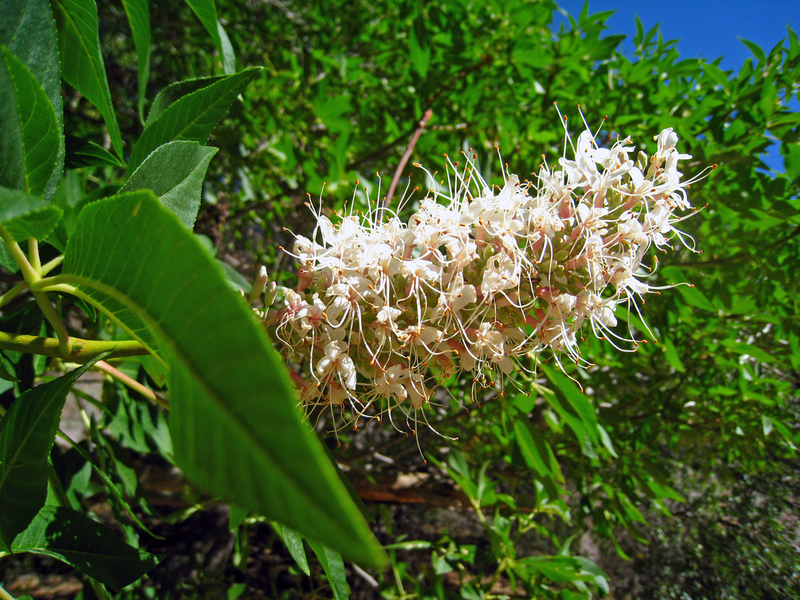 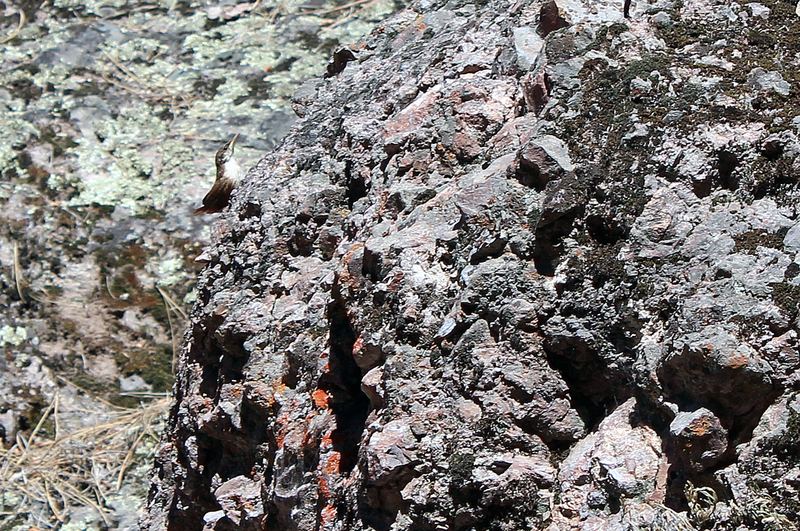 At around 400 species, Pinnacles boasts the highest density of different types of bees on Earth. 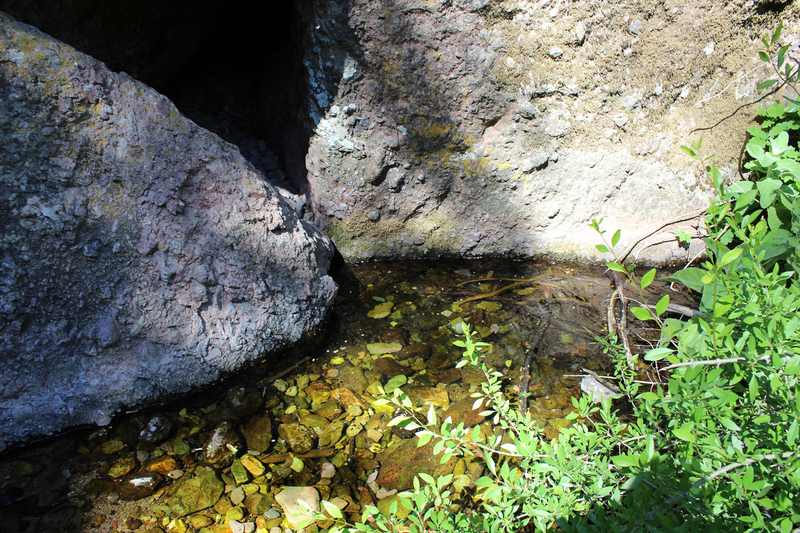 This image captures just how lush the riparian zone is at the creek’s edge. 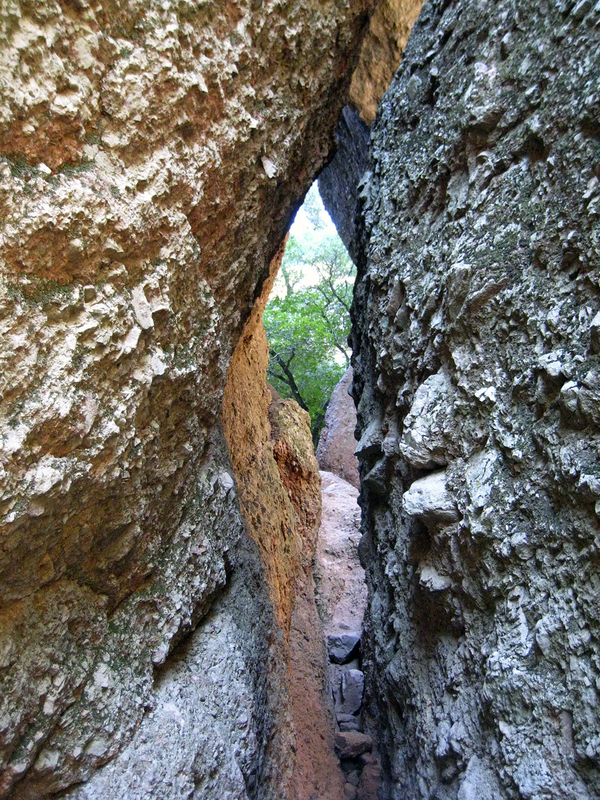 Both the canyon and the trail narrowed as we approached the entrance to the cave. 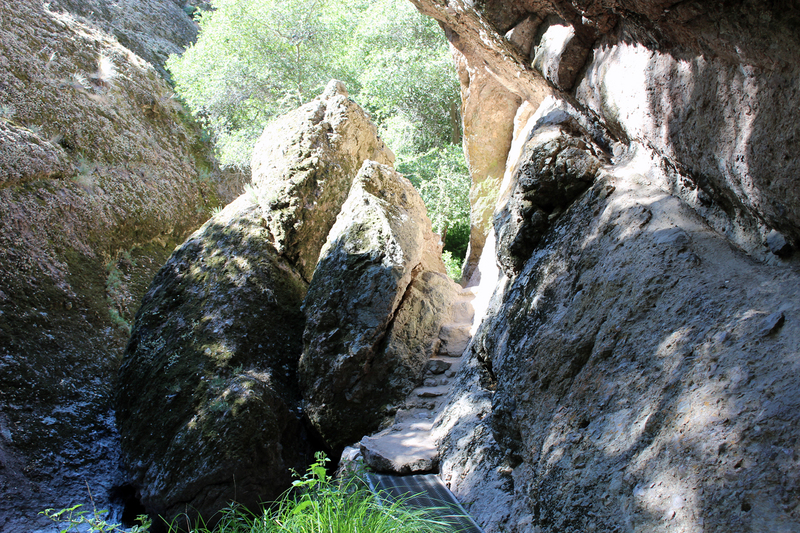 The image above shows the trail, with a small metal bridge and steps hewn into the rock, heading southwest. 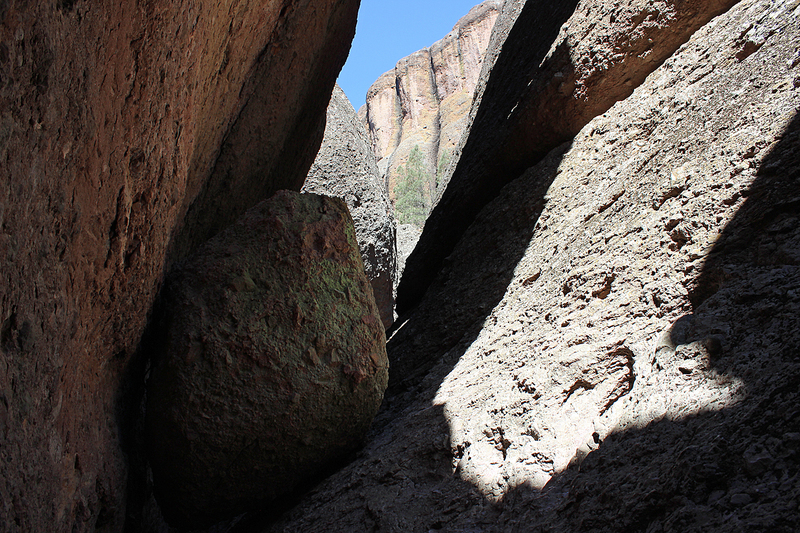 I took the image below from the same spot, looking back at the canyon floor from the direction we’d traveled. 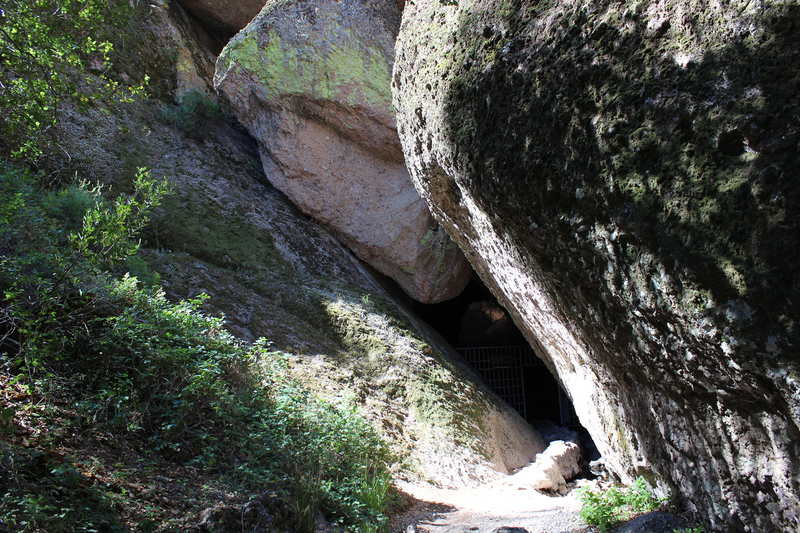 Balconies Cave is one of two talus caves open to the public in the park (although the other, Bear Gulch Cave, closes seasonally when its population of Townshend’s Big-Eared Bats are raising their young). 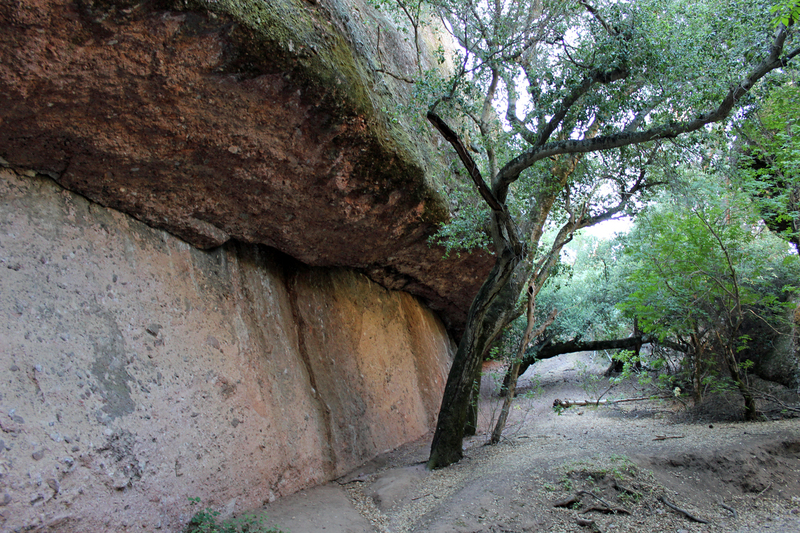 Unlike limestone or lava tube caves, which are created underground by leaching water and erosion, talus caves are created by rocks and boulders breaking away from the canyon walls and creating a cave above the canyon floor. 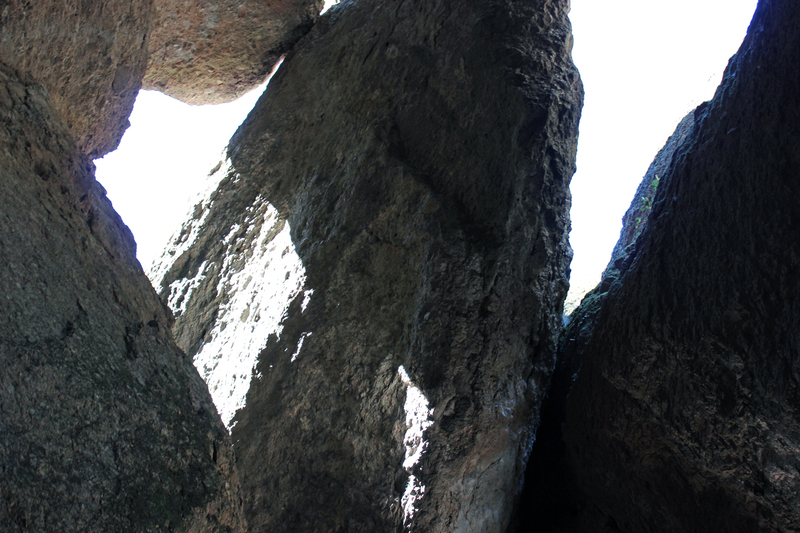 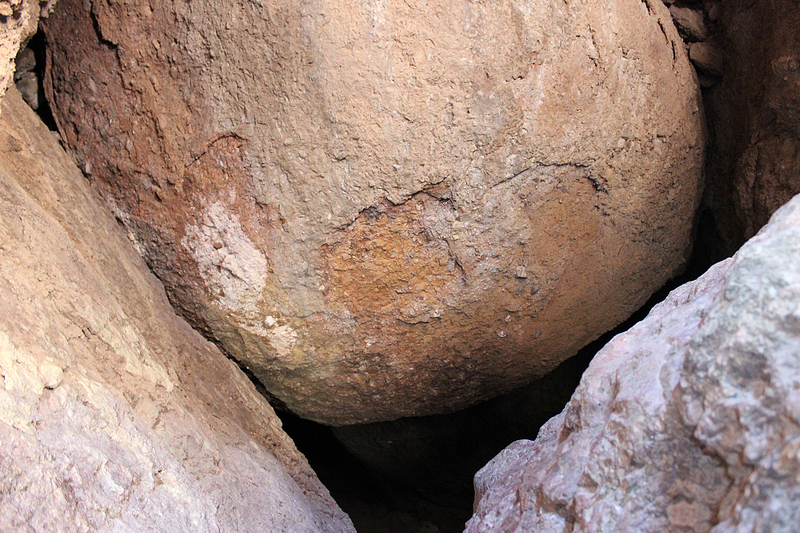 The roof of the cave is comprised of immense talus boulders wedged together. 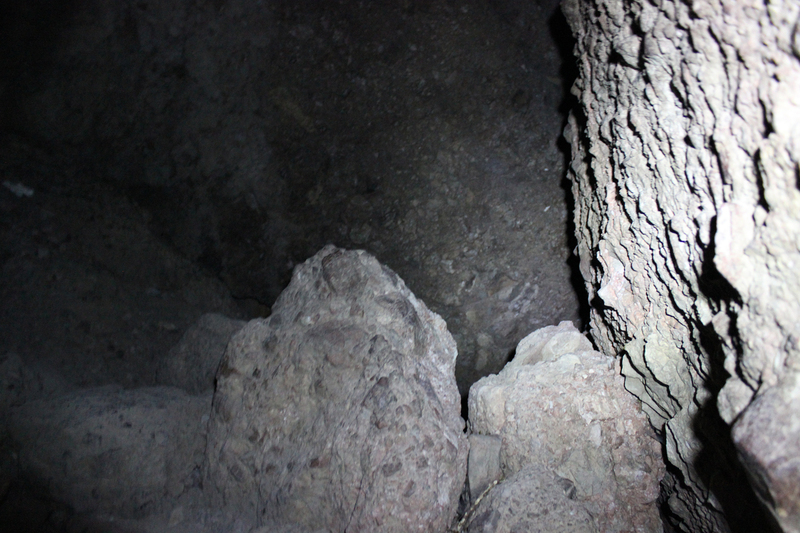 The first room in Balconies Cave was open and spacious. 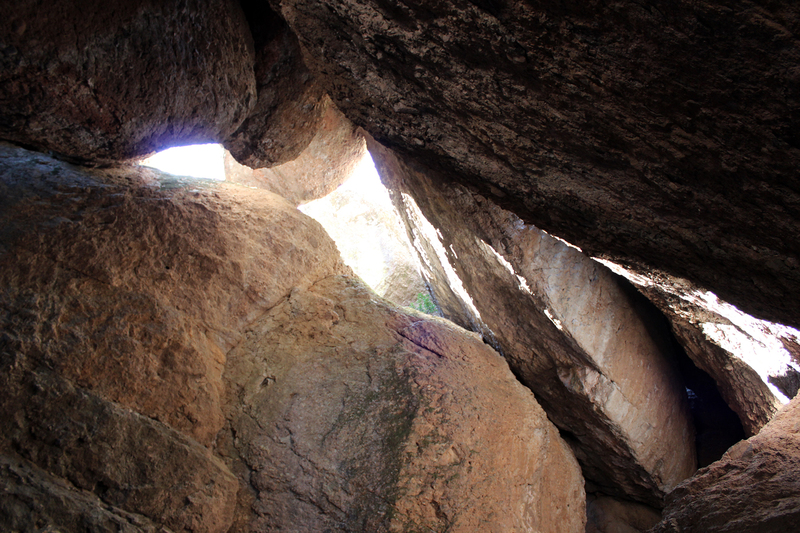 Light streamed down from between the boulders above. 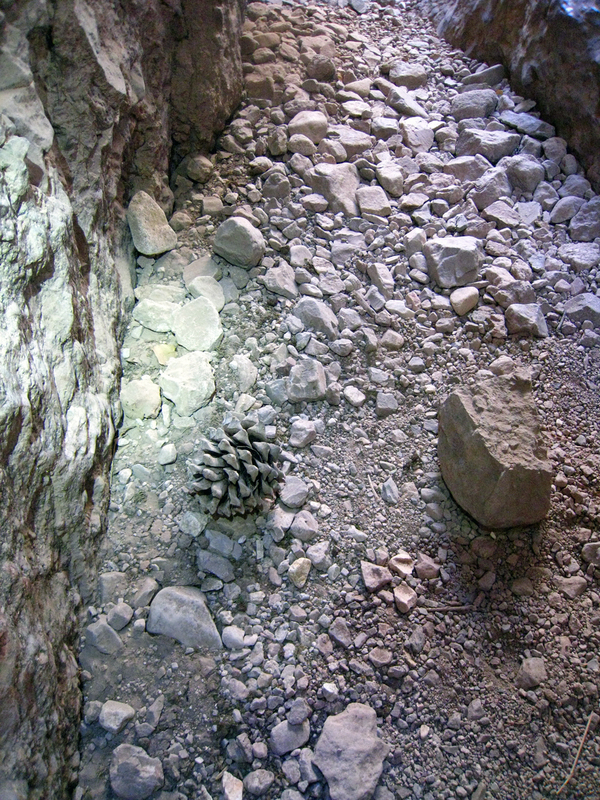 We stood in the first room for a long moment unsure of which way to go. 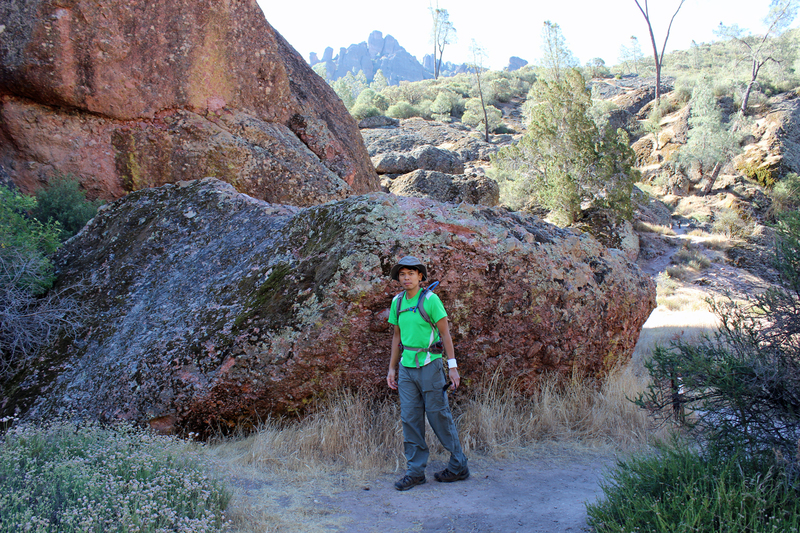 It seemed that the trail simply ended with no obvious path forward. 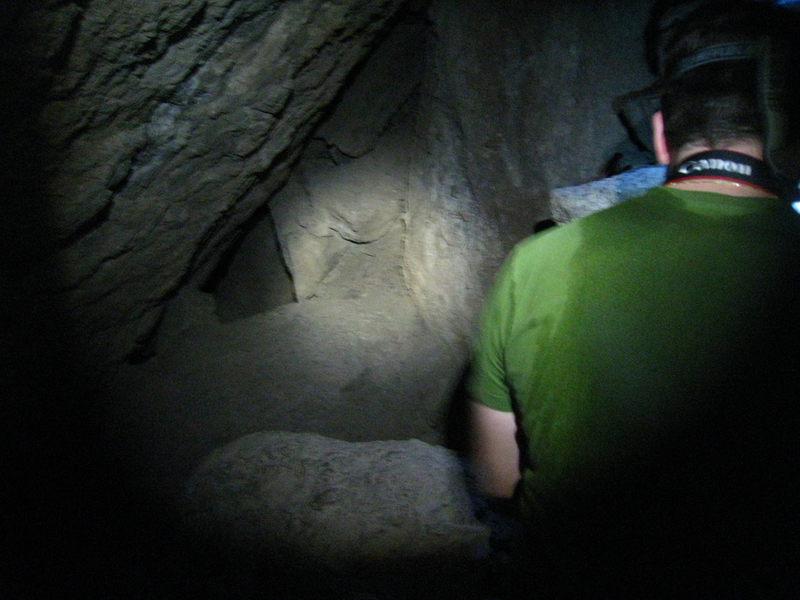 Then Sean noticed a small white arrow painted on a rock, and we realized that we had to squeeze up and into a narrow passage into darkness. 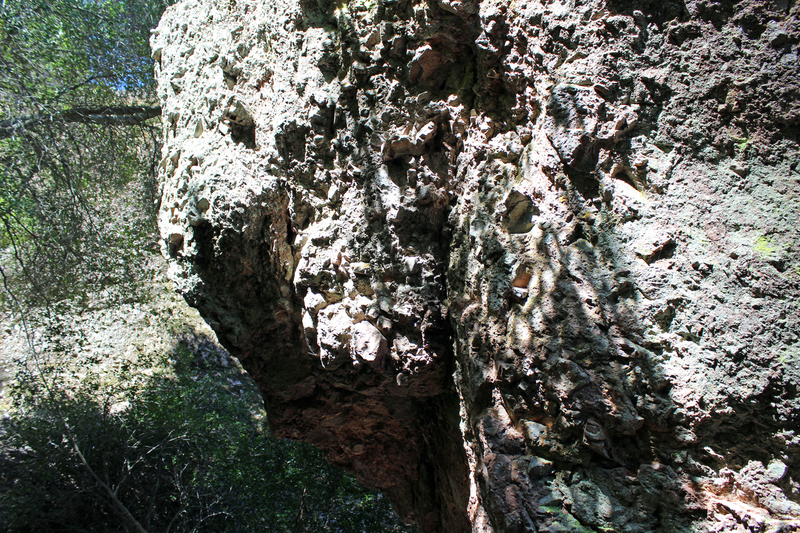 That was where the trail led. 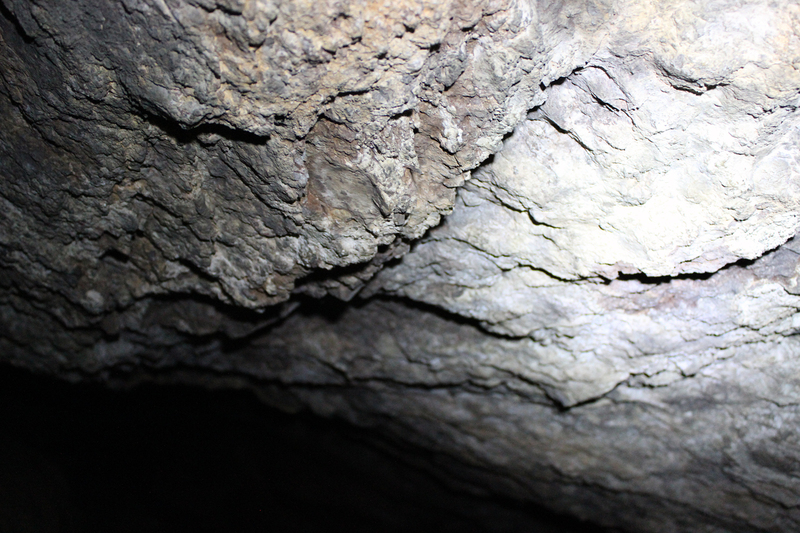 We turned on our headlamps and continued on our way, passing through a series of tunnels and chambers that were nearly completely dark, climbing up and through the cave. 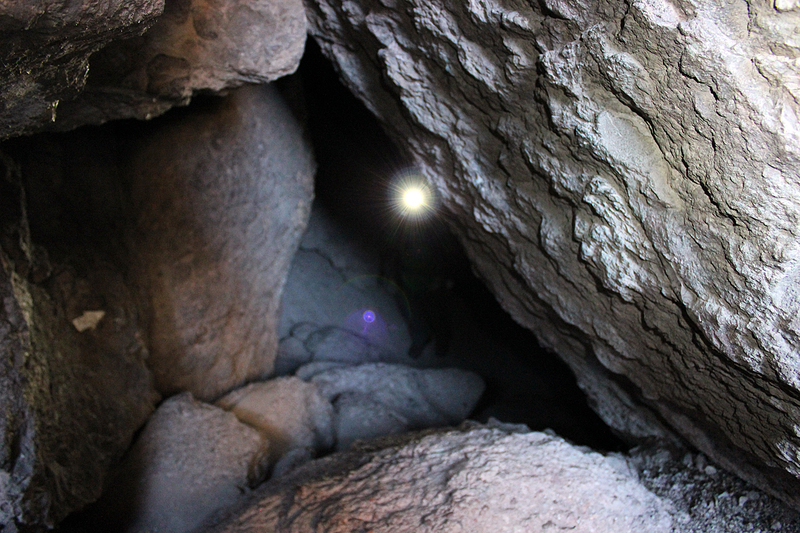 Looking back, Sean’s headlamp is almost all I can see of him. 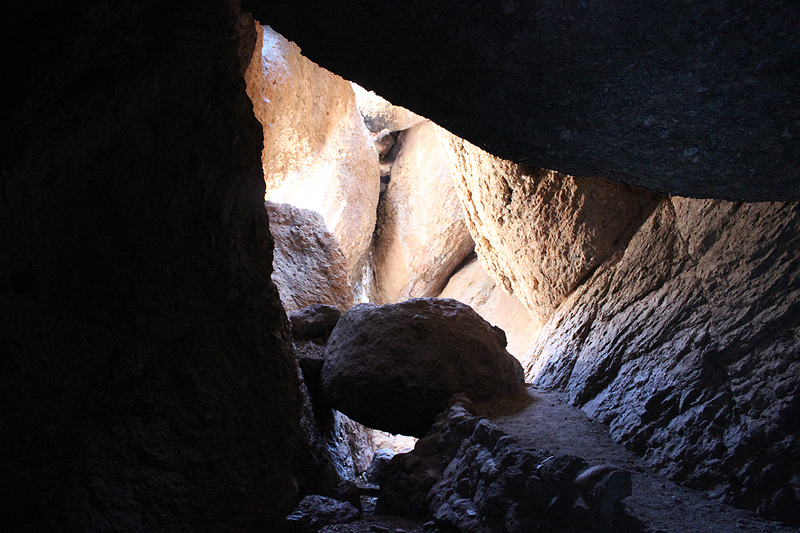 Soon we were climbing out of the cave. 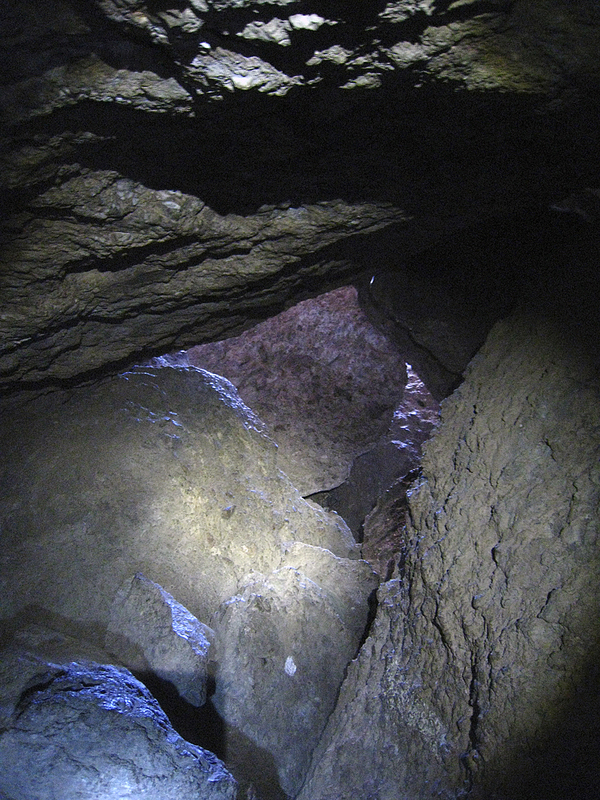 The arrows (one is visible in the image above, pointing up, another in the image below, pointing down for those traveling the trail in the opposite direction) pointed to the final climb up and out of this section of the cave. 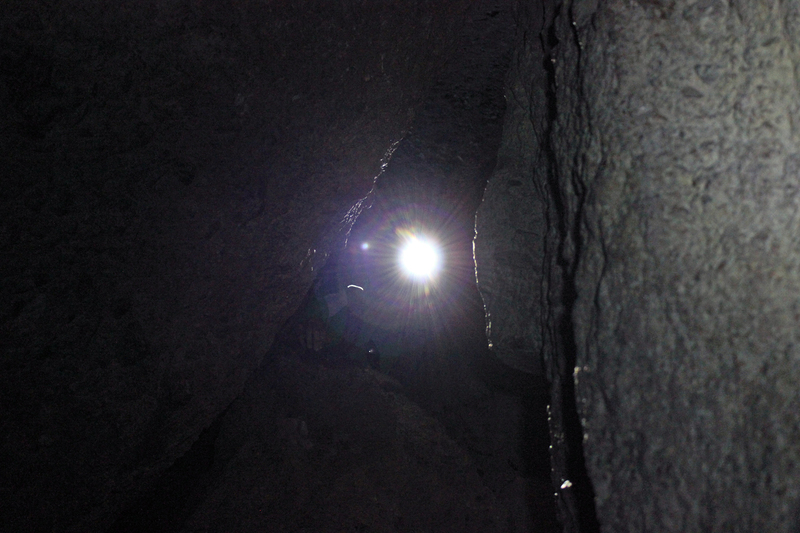 The view back down into the cave and Sean’s headlamp after I’d climbed out. 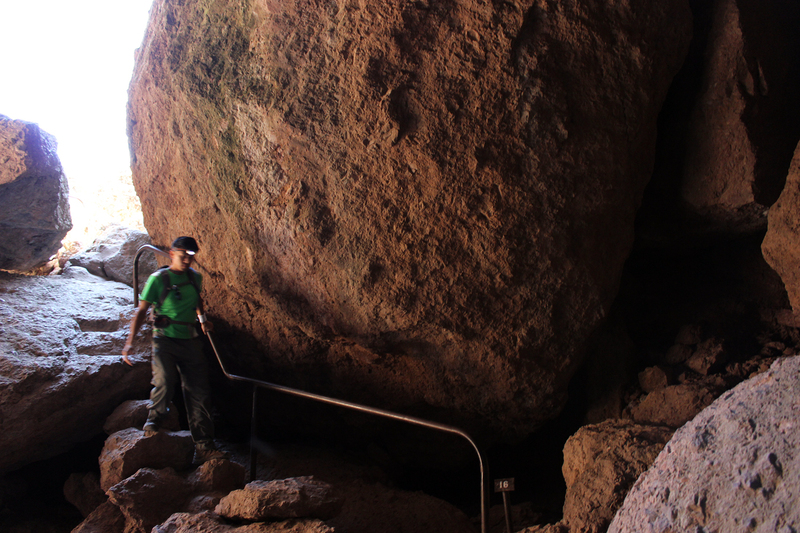 After a short hike among the boulders, the trail reentered the cave into a second large room. 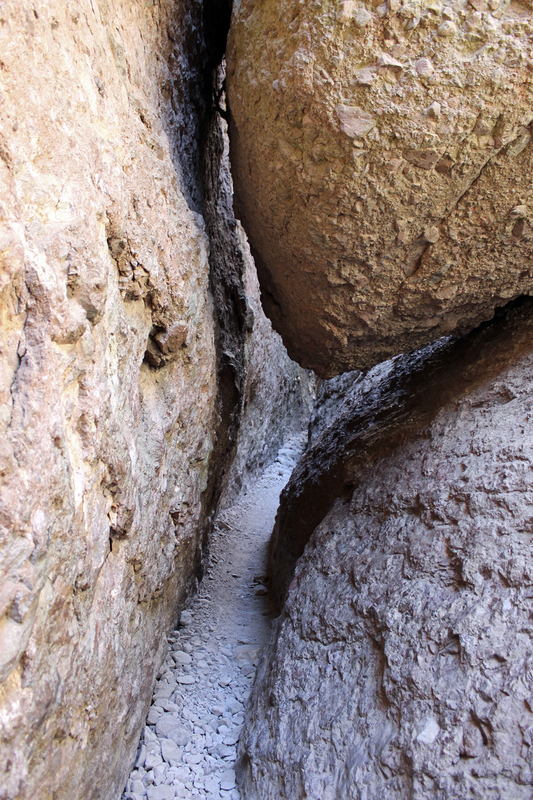 From there the trail led through a section that was less cave and more extremely narrow canyon floor with huge rocks overhead. 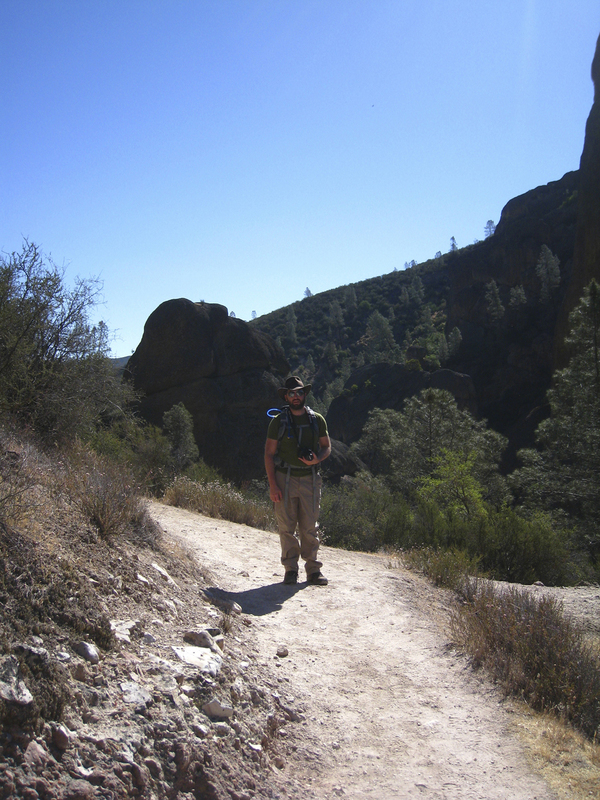 Soon we reemerged onto the wider, sweet-smelling section of the canyon floor near the spot that the trail forked toward the Balconies cliffs switchbacks. 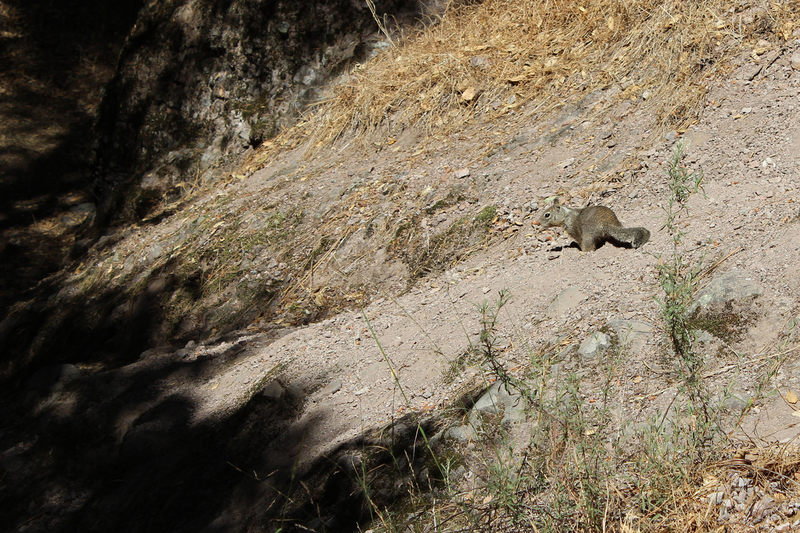 It was only at this point, near the conclusion of our hike, that we encountered a few other hikers. 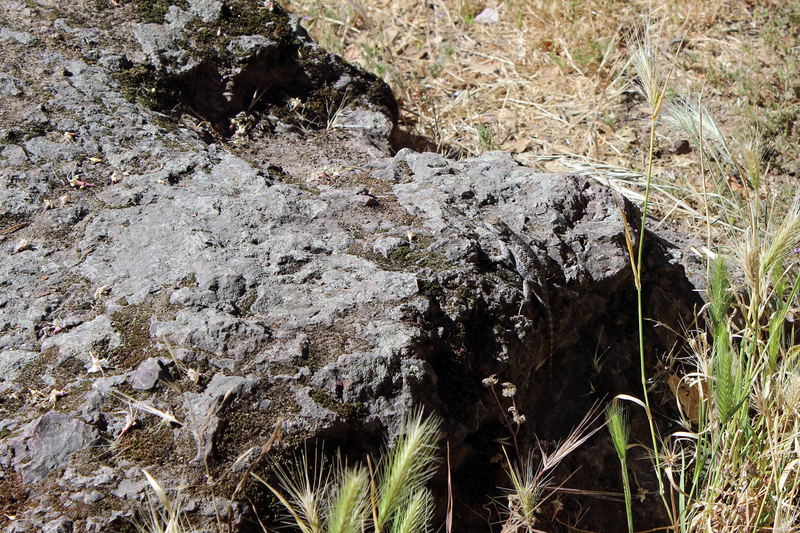 As we emerged from the canyon, we paused to watch a pair of Canyon Wrens darting about on the rocks catching insects. 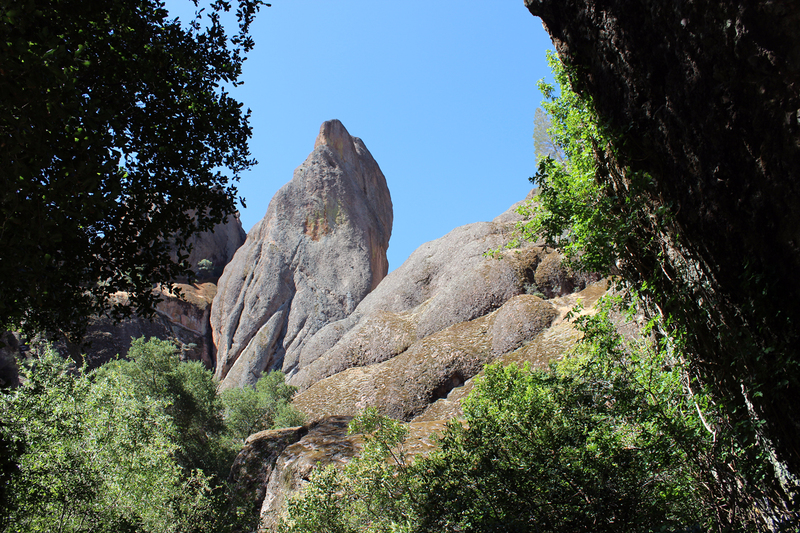 We finished the hike at about 10:45, filled our water bladders, and had a snack. 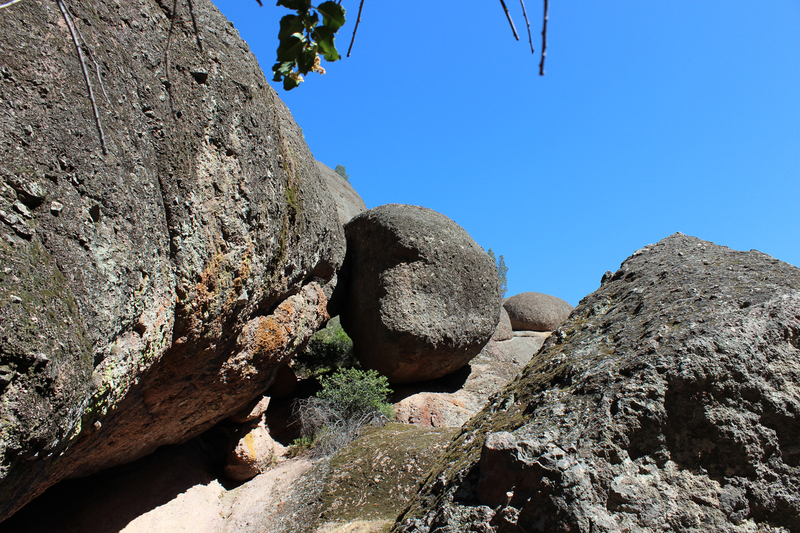 Although we hadn’t had too much sleep, we were exhilarated and ready for another. 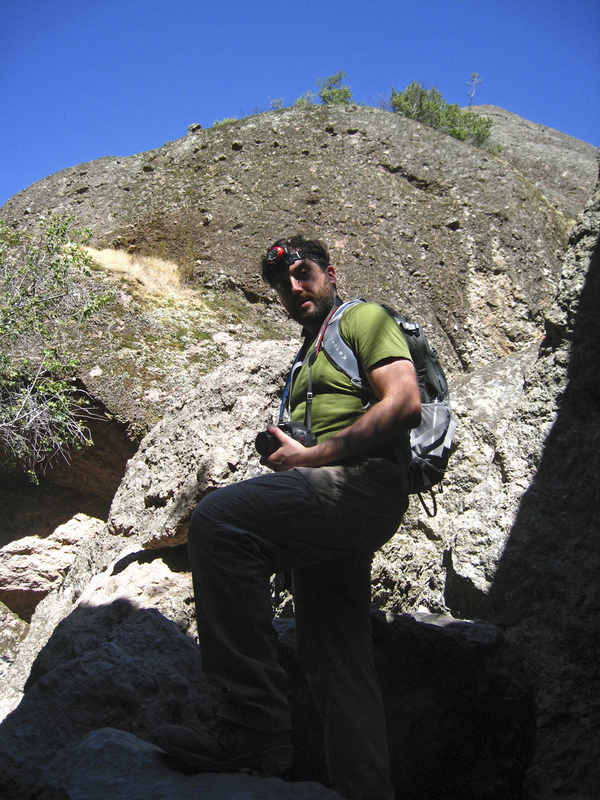 It was time to climb into the High Peaks. 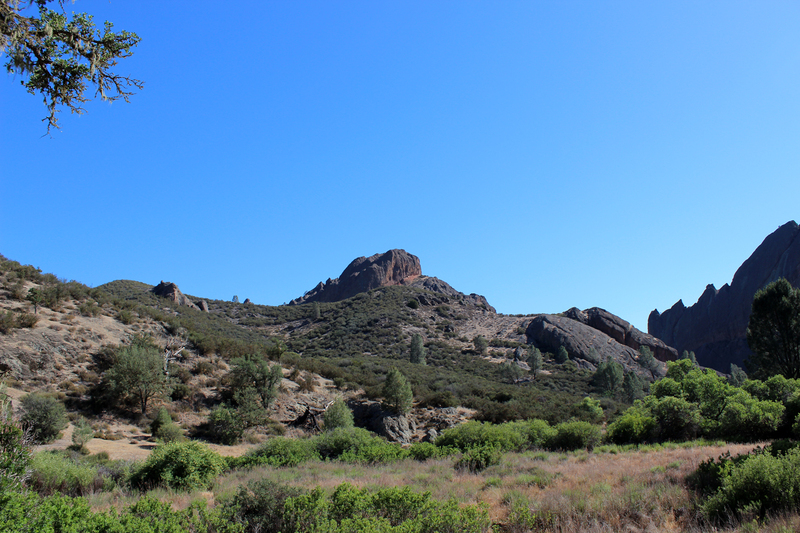 This entry was posted in Journey and tagged California, Day Hike, Pinnacles on June 16, 2013 by Brandon Hayes.